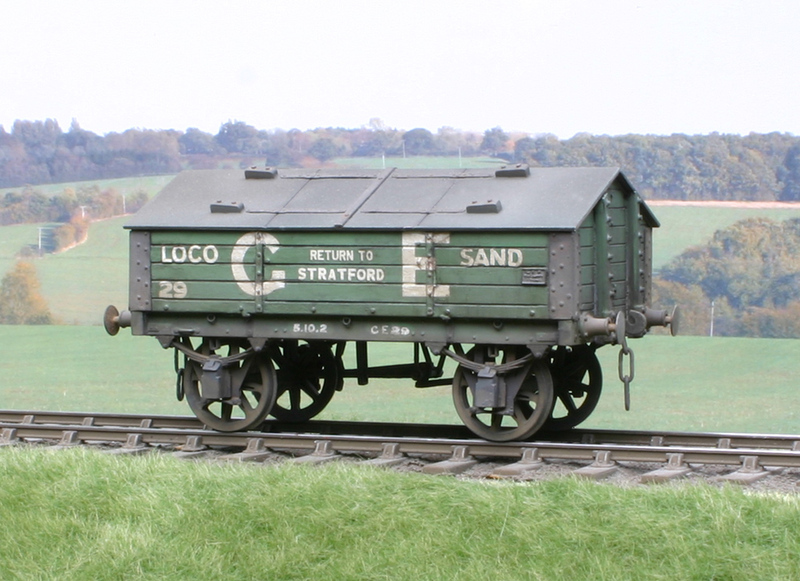 With the exception of a batch of new wagons built for a specific purpose, all of the Great Eastern Railway’s loco sand wagons were created as required from withdrawn high-sided wagons described in parts 1-4 of this series. As they travelled a very limited mileage it was deemed economical for the Locomotive Superintendent to purchase and convert a wagon withdrawn from revenue earning stock, give the underframe and running gear a thorough overhaul, repair or construct new bodywork and paint them in Departmental green. 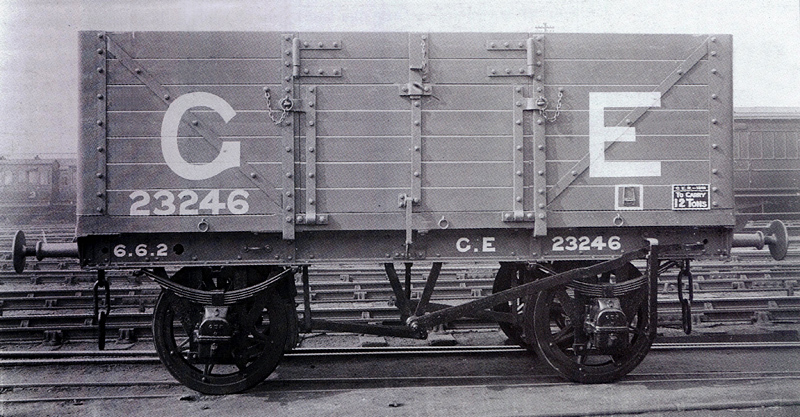 As a consequence many sand wagons were unique, and in later years the advent of newer types of axleboxes, buffers and brake regulations added to their disparate nature. Sand Wagons for Locomotive Depot from Locomotive Superintendent re supply of sand from Mr Boam of Lynn. 100 tons per week at 1/- per ton ready for use. 30 new wagons required for this work at £1800 cost. 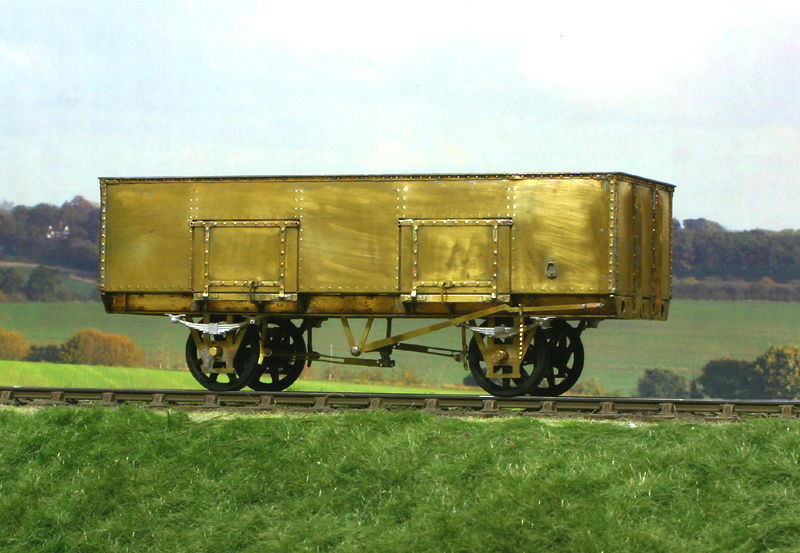 These wagons were constructed the following year and incorporated the standard 15ft steel underframe as used on the contemporary Diagram 17 opens. Much of the limited information on Great Eastern sand wagons in the public domain comes from a wagon discovered by John Watling (GER Soc. President & HMR Soc. GER Cariage & Wagon Steward) in the yard at Ipswich during August 1957. At that time access to General Arrangement drawings and official documents held by British Railways was out of the question, and there was little information on wagons available to the public. As a consequence, whenever it was possible, measurements of ex-GER wagons were taken by John and a drawing produced, and in the case of the sand wagons, a short history was written and published in the Model Railway News in February 1959. Since the early 1970s much information has come to light, mostly thanks to diligent research carried out by John which included finally gaining access to and making copies of hundreds of rolling stock drawings held at Stratford, so now there is a vast wealth of information which can be gleaned from both the Great Eastern Railway Society and from the GAs held at the NRM. Of course these official documents highlight any errors John made in his drawings, most of which are no more than conjecture of pre-Grouping features no longer extant on the wagons he saw during the 50s and 60s. It is unfortunate then, that his flawed drawing of a GE period sand wagon was reproduced in Peter Tatlow’s recent book, although to be fair to the author there is still nothing comparable and its inclusion does at least serve to show the type of wagon the company used. However, it is far more regrettable that the high quality 7mm Connoisseur kit is based upon the same drawing. 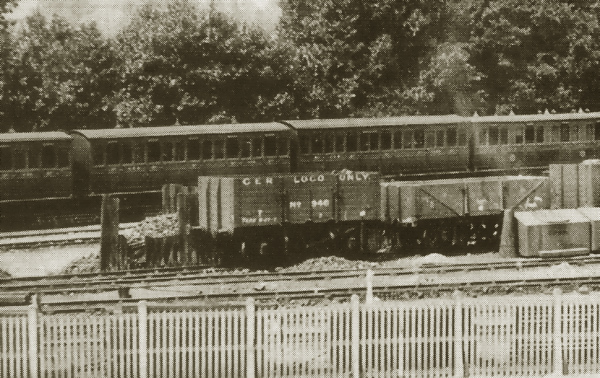 The Ipswich wagon, LNER number 600023, was originally a round-ended open (as seen in Part One) built in 1873, and withdrawn from capital stock in 1895. 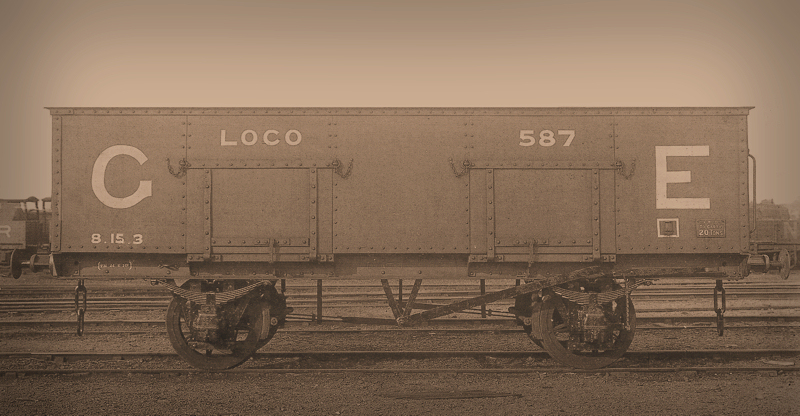 As with many of these wagons, on delivery to the Locomotive Department the body was removed, the underframe overhauled, and a new body constructed with a pitch roof incorporating double-doors. The lettering style (even for post-1903) and wording is wrong. The running number 23 incorrect and should be in the 2001 – 9999 range. The combined rectangular build/tonnage plate wrong – separate ellipse plates should be fitted. The short buffers should be mounted on 12” square by 3” thick oak blocks. When I became aware of these problems in the spring of 2006 I decided I wanted to backdate the wagon to the pre-1902 livery, but procrastinated over stripping the paint and making the alterations and it’s very fortunate I did, or I might be preparing the model for another trip to the cellulose baths. 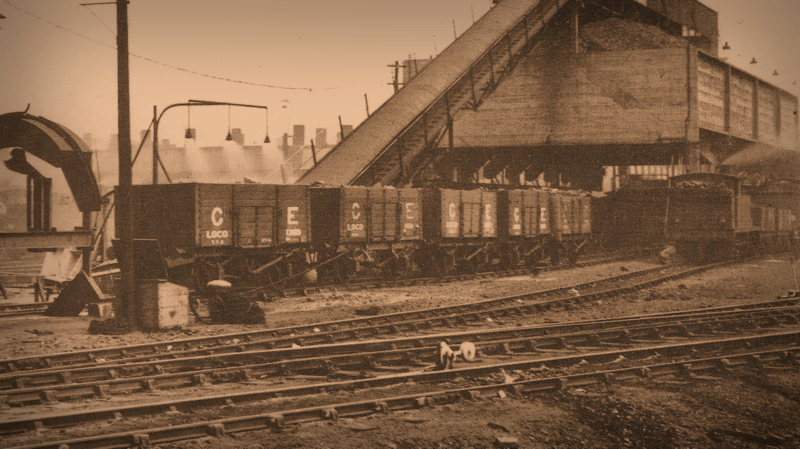 Last year I bought an old photograph, now long out of copyright, which shows hitherto unknown lettering present on the sides of these wagons in the GE period. The photograph is a portrait of Class D56 No.1857 at Liverpool Street, sitting almost underneath Pindar Street bridge on the East Side. In the background, by the retaining wall, parked in the long headshunt to the platform 18 loco bay, are two loco sand wagons. 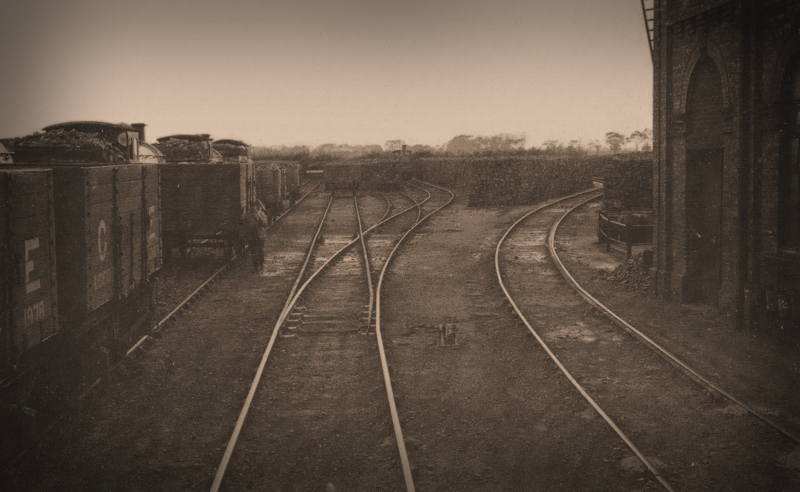 Other contemporary photographs show that this siding was their usual spot, often alongside a raft of loco coal wagons, but it seems that it is the first photograph from this period in which the wagons are seen close-up, as this location is usually seen in the distance. 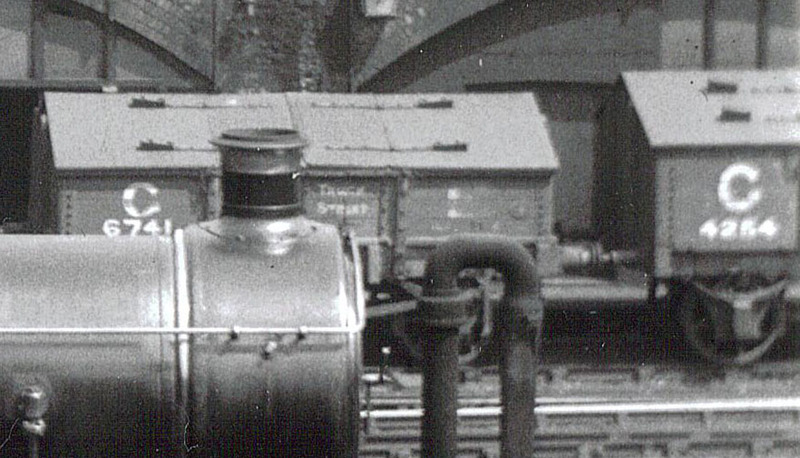 A high-res scan and enlargment of the relevant portion of the photograph has revealed some lettering which was previously unknown, and at last we also have two genuine running numbers. All is not completely resolved, thanks to the inconsiderate position of the loco chimney, but following discussion with John, we have postulated what is missing. Which is significantly different to what was previously believed the wording would be (seen on the model above). 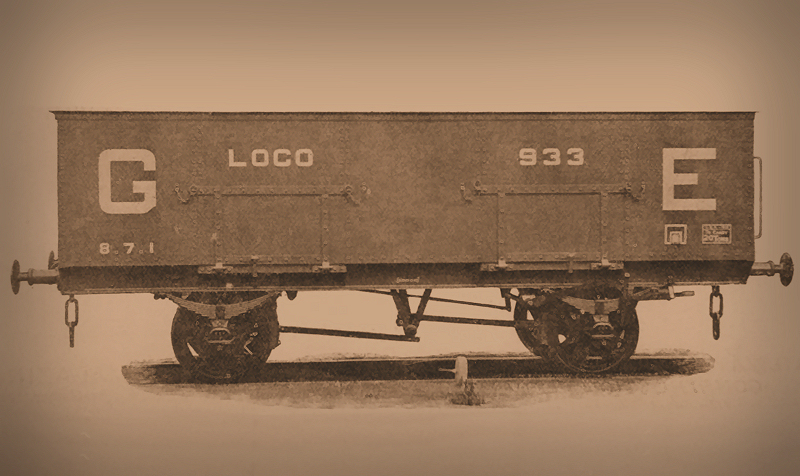 Until further information comes to light, that is the extent of our knowledge regarding the wording on these wagons. To be able to disseminate this new historical information lost in the mists of time for almost century is something I have to admit I’m rather pleased with, and is one of the raisons d’être of this journal. The use of the word ‘truck’ might cause some raised eyebrows amongst serious modellers, but for those not familiar with Great Eastern terminology, the word truck in relation to a wagon had legitimate usage; a wagon was loaded open goods vehicle, and a truck was an empty one. In relation to Basilica Fields, the model above (once re-liveried) will be an important feature of the loco depot at Angel Yard in The Rookery. I’ve built it with a working brake lever so that once shoved up its siding the brakes will be put on before being uncoupled. All good fun and will add to the verisimilitude of the scene. Following on from the discussion generated in parts one and three in this series of Great Eastern wagons on wheels inserts, through the post came a packet from Andy Beaton of Ragstone Models, purveyor of fine kits and castings for the discerning modeller, in which were two pre-production etches for these very wheel inserts. WK302 are scaled at 3½” wide and WK301 at 2″ wide. 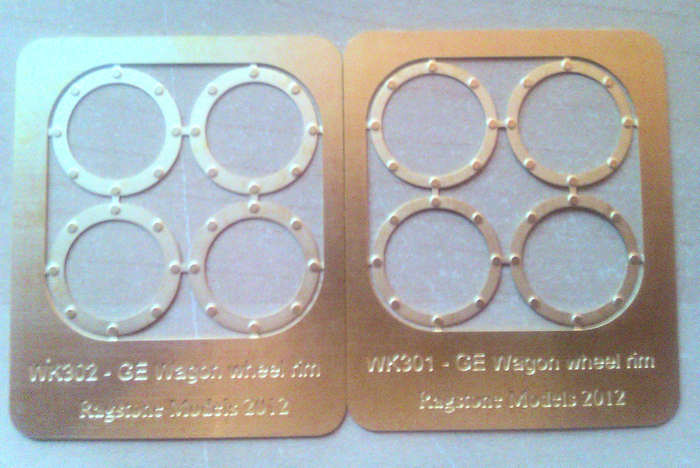 Even though my GA for a GE wagon of the 1890s doesn’t indicate the dimensions of the insert, I was able to ascertain the width was probably about 2¾”. Following discussion with Andy we agreed that the thinner one ‘looks right’ when installed on a Slater’s wheel, and I’ll follow this post up later with photos showing this. I suggested to Andy that the domed bolts looked a bit too big on the narrower inserts, but conversely, the ratio of the rivet size to the width of the wider insert looked pretty good. Once painted, weathered and given suitable highlights and shadows I’m sure they will look the part.